Divinity contains the flashiest gold glitter of varying sizes with a subtle sprinkling of silver holographic glitter. Looks amazing on its own or layer it over different colored bases to create a never-ending assortment of custom looks. Sugarpill Cosmetics Nail Lacquers are vegan, cruelty-free and 5-Free. 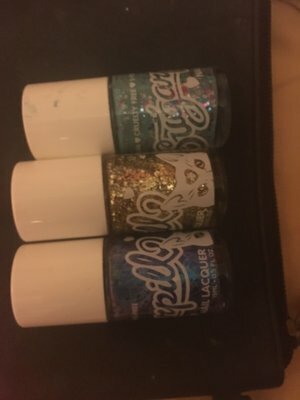 I picked up three of Sugarpill's nail lacquer's at IMATS last year before they were officially released. Mostly because I'm a Sugarpill fan and because they were exclusive since they weren't released yet. If you are familiar with the indie nail polish scene then most of these shades won't be so unique to you, and I completely agree. However I wanted to try them out. I was pleasantly surprised when I recently used Electric Halo. 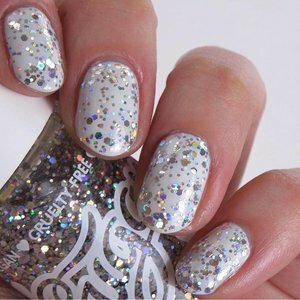 It is a chunky holographic glitter topper, which isn't all that unique BUT the glitter payoff and the amount of holo sparkle is just perfect. It was easy to apply without too much pushing of glitter placement and without being flooded by clear base. I love it so much as a topper and would probably be amazing for full coverage if you sponge it on. My favorite pairing was with OPI My Boyfriend Scales Walls as a base color. I am a die-hard fan of Sugarpill, so when they released a nail polish collection, I had to try a couple. I own five or so, but I suppose I'll land on Catmosphere to review, considering it's the one I go to most. Catmosphere is a perfect example of how adorable and effective Sugarpill's nail lacquers are. A gorgeous, powerfully opaque base with gorgeous sparkle. I like to play it safe and at least do two layers with most polishes, so when you do so with Catmosphere, it just sets it off so hard -- the sparkle is everywhere, the blue is nearly atomic in color quality, it just makes your hands a work of art you can't look away from. If you haven't tried these nail lacquers, even as an overlay, I highly recommend them. None of the other colors caught my eye like divinity did. It has the best amount of glittery sparkly explosion that I was looking for. I put it on about a week ago and I can't stop looking at it. 1 coat is nice and subtle while 2 coats is AMAZING! The name is perfect. This nail polish gave my nails the most complements! Glittertastic 💓 So good. My new favorite topper for nails. It does look nice on its own though if you want some glitter on bare nails. Okay so the base is a light pink and it's full of glitter sprinkles. I want to eat it. You need to do at least two coats however or it won't look even. Angel Cake is an adorable polish. It came out a bit more pink than anticipated but I guess I would prefer that over white. The sparkles and bits actually applied with no problem if you layer up. I did two layers and had plenty of sparkle and color. Covered with a top coat and got a week of wear. I love this polish it is hard to get the little circles in just the right spot. So femme I'm in love! !